(Nanowerk News) Researchers working at the Advanced Light Source (ALS) of the U.S. Department of Energy (DOE)'s Lawrence Berkeley National Laboratory (Berkeley Lab) have combined key features of two highly acclaimed X-ray spectroscopy techniques into a new technique that offers sub-nanometer resolution of every chemical element to be found at heterogeneous interfaces, such as those in batteries and fuel cells. This new technique is called SWAPPS for Standing Wave Ambient Pressure Photoelectron Spectroscopy, and it combines standing-wave photoelectron spectroscopy (SWPS) with high ambient pressure photoelectron spectroscopy (APPS). "SWAPPS enables us to study a host of surface chemical processes under realistic pressure conditions and for systems related to energy production, such as electrochemical cells, batteries, fuel cells and photovoltaic cells, as well as in catalysis and environmental science," says Charles Fadley, a physicist who holds joint appointments with Berkeley Lab's Materials Sciences Division and the University of California Davis, where he is a Distinguished Professor of Physics. "SWAPPS provides all the advantages of the widely used technique of X-ray photoelectron spectroscopy, including element and chemical-state sensitivity, and quantitative analysis of relative concentrations of all species present. However with SWAPPS we don't require the usual ultrahigh vacuum, which means we can measure the interfaces between volatile liquids and solids." Fadley is one of three corresponding authors of a paper describing SWAPPS in Nature Communications ("Concentration and chemical-state profiles at heterogeneous interfaces with sub-nm accuracy from standing-wave ambient-pressure photoemission"). The other two corresponding authors are Hendrik Bluhm, with Berkeley Lab's Chemical Sciences Division, a pioneer in the development of APPS, and Slavomír Nemšák, now with Germany's Jülich Peter Grünberg Institute. "Heterogeneous processes at solid/gas, liquid/gas and solid/liquid interfaces are ubiquitous in modern devices and technologies but often difficult to study quantitatively," Bluhm says. "Full characterization requires measuring the depth profiles of chemical composition and state with enhanced sensitivity in narrow interfacial regions at the nanometer scale. By combining features of SWPS and APPS techniques, we can use SWAPPS to measure the elemental and chemical composition of heterogeneous interfaces with sub-nanometer resolution in the direction perpendicular to the interface." 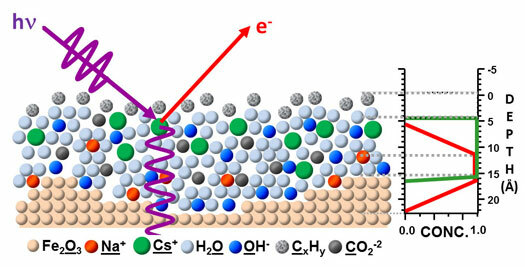 Says Fadley, "We believe SWAPPS will deliver vital information about the structure and chemistry of liquid/vapor and liquid/solid interfaces, in particular the electrical double layer whose structure is critical to the operation of batteries, fuel cells and all of electrochemistry, but which is still not understood at a microscopic level." 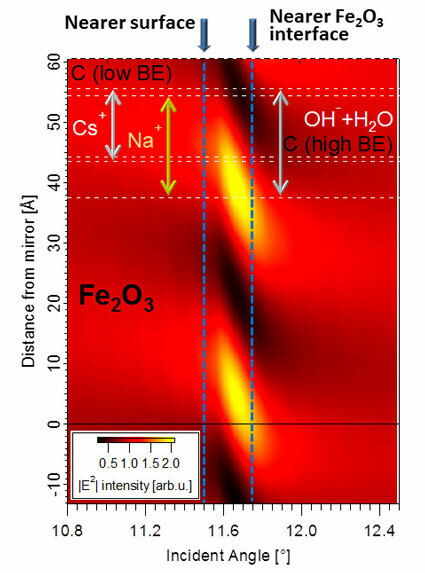 "We determined that the sodium ions are located close to the iron oxide/solution interface, while cesium ions are on average not in direct contact with the solid/liquid interface," Bluhm says. "We also discovered that there are two different kinds of carbon species, one hydrophobic, which is located exclusively in a thin film at the liquid/vapor interface, and a hydrophilic carbonate or carboxyl that is evenly distributed throughout the liquid film." "Tailoring the X-ray wave field into a standing wave can be used to achieve greater depth sensitivity in photoelectron spectroscopy," Fadley says. "Our combination of an oscillatory standing-wave field and the exponential decay of the photoelectron signal at each interface gives us unprecedented depth resolution." "The range of future applications and measurement scenarios for SWAPPS is enormous," Fadley says.